The Protechmasta Ear Bonnet helps to ease muscle tension through the poll and brow area, with added soundproof ears to prevent noise distractions and help improve concentration. A naturalistic ceramic infused lining emits a safe form of Far Infrared radiation which is a natural process and is scientifically proven to gently and safely assist blood circulation, therefore, helping to ease muscle tension, aid relaxation and help in the prevention of injury. Why Use Protechmasta Ear Bonnet with soundproof ears? Will the Protechmasta Ear Bonnet help with headshaking? We have had many reviews from our customers who have said the Protechmasta poll pad and fly veil products have helped with head shaking. *DISCLAIMER* The Protechmasta products are not a replacement for professional medical advice or treatment. Consult your vet if you are unsure. Lovely quality product that fits perfectly! Can’t wait to try it out and about. Wonderful product , stopped the spooking ! Love this very comfortable and well made, great value for money but does come up a bit small. Love this product, mare is much calmer & focused while wearing the fly veil when out competing. Brought this for my mum's horse as he is very sensitive to sounds, wind etc round his ears, he seems to really like i and is much more relaxed, he is also usually tight through the poll but since using this he has showed a marked difference. Makes such a difference to my horse when riding! So much more soft and happy to work! Love it. Used it to help with the firework display. Really helped keep the horses calmer. Excellent!! Calmed our anxious ponies, reduced spooking a lot. Washes well. Very pleased with my Protechmasta fly Veil , fitted well , loved the velcro straps , very comfortable for my fussy boy too , thankyou Harry Hall . Well I'm not sure how it works but somehow this had a great affect on my usually very tense horse. Calmest Dr test and sj round and a pleasure xc on Sunday! Great investment! Definitely made a difference in my mare immediately - softer through her poll region. Looking forward to trying it on the other horses! Great quality ! Padding all around the ears and back, only con is that now my horse is able to slip his bridle of with it. Side straps help secure the fly veil onto your bridle with ease. Highly recommend this product. Good quality material and the Velcro fastenings help to keep it secure. Usually a cob size fits my horse, but this comes up a bit small. I prefer the protechmaster poll guard as the fly veil is a bit bulky especially around the ears. Think the poll guard does a better job at distributing the pressure around the ears. Great quality but I found cob was too small for my small 16h dressage horse so I had to to one size up. I was recommended this by my trainer as my horse is noise sensitive. I used the the fly veil for the first time today at the Sheepgate Area Festival and the difference in my horse was amazing. He was calm and relaxed, soft in his poll, and was not bothered by the loud speaker or anything. I would highly recommend this fly veil to anyone who has a noise sensitive horse. I read the information about this and thought it was worth a try. Although I have only used it once so far, it really helped to keep my sharp horse focused in a busy arena. Fitted well and looks nice. fantastic, easy to fit and and I found it is machine washable. Very impressed with this range. Great fit, Material and effect. Whilst this is primarily about the fly veil, I also purchased the GP numnah and bandages which are fantastic. Incredible quality. The bandages when used, removed and immediately there is no heat in them even in this extreme heat. Highly recommend this range and have mentioned to many to invest. Fits nicely and seems to reduce head shaking and tension. Bought this fly veil in the hope it would stop my young mare being distracted by noises around her when schooling, and the infra red technology would encourage and improve flexion and relaxation over the poll. Well, I am incredibly impressed!!!! Immediately her concentration has improved 10 fold, she is light and attentive with lovely floppy ears! It's done exactly what I want it to do. It stays put, she's clearly comfortable in it. Contemplating buying another for when this one goes in the wash!! Great fit and helps my boy to be more focused and calmer when out and about. I just love this range, and the fly veil doesn't disappoint. It's a great fit, and it really does seem to help my horse to relax. Wears well and also washes well, coming up as new. My horse has lost confidence jumping so I have tried to reduce his stress and keep his focus. The Protecasta Infrared Fly Veil has worked wonders. We had our best ever round at the weekend, he was so focused and relaxed and really enjoyed himself. Really happy with my purchase. Fabulous veil , much calmer more focussed horse since wearing it . Brilliant concept & really works. 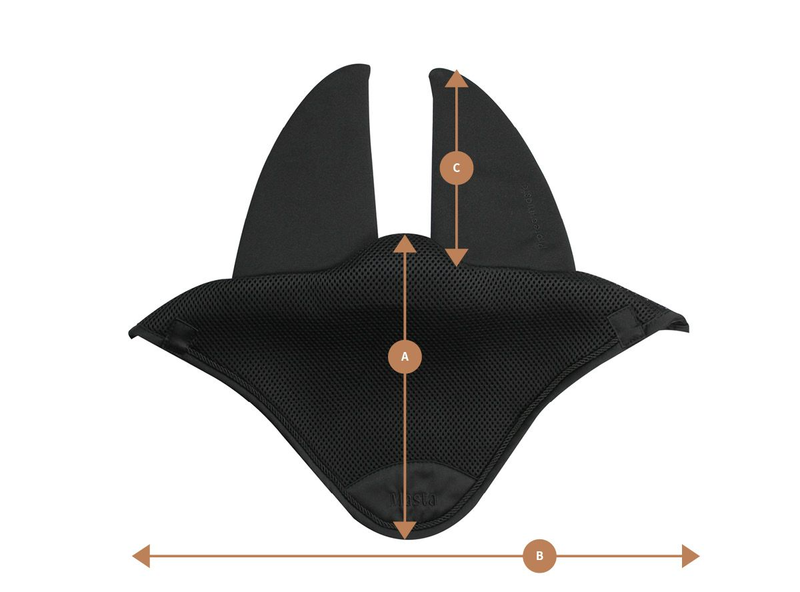 The new Protechmasta Infrared Fly Veil has really helped my horse stay relaxed and focused, less tense through the poll with the added bonus it’s soundproof, keeping his concentration in his training for better marks in the dressage boards. Very good product hoping it will change my pony’s behaviour when being ridden. I might even stay on ! Used this on my mare at her second dressage competition and she felt very relaxed, I also have the pollguard which attaches to the head collar which she travelled with. I felt it made a difference to her warm up and attitude away from home in a new environment. Will continue to use it, the only down side being she managed to shake her bridle off after the competition whilst wearing this! My mare is a different horse with her Protechmasta Infrared Fly Veil on. She’s not spooky, concentrates 100% and works amazingly. Highly recommend and would purchase again. I have a gelding who is very distracted by noise and hates clapping etc. Two days after purchasing our Protechmasta flyveil we competed at dressage where many people comented on how relaxed he was and ignored everything going on around him. We won our class and will definitely be wearing for all future competitions and at home. Has been a great purchase for us. Not only does this protect my horse from flies but he is so much more attentive when wearing this! It’s really cushioned and well made. It even stops him spooking when other horses are being turned out, unloaded - it must muffle out the distracting sounds. Will put it on him at our next dressage event. Fantastic material, very comfortable and breathable for your horse. My mare instantly seemed more relaxed in her poll and they look really smart. Very happy!